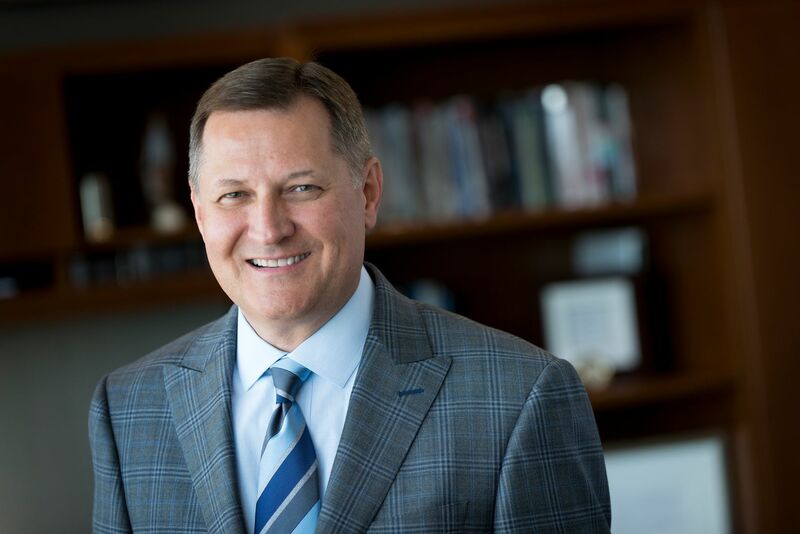 In this exclusive interview, Terry Shaw, head of the newly rebranded AdventHealth — one of the largest non-profit health care systems in the US — talks about starting as an intern and working his way up, why the name change is a big deal, and his goal of making spiritual care a bigger part of the patient experience. Question: Recently, the 47-hospital system headquartered in Altamonte Springs, Florida, officially changed its name from Adventist Health System to AdventHealth. Is this a big deal? Why the change? Answer: Going from Adventist Health System to AdventHealth is definitely a big deal. It’s about making things easier for consumers. One of the biggest issues in health care today is the difficulty consumers experience navigating the system to find the care they need. Previously, our system consisted of about 30 different hospital brands. Now, as one connected system of care with one name, consumers seeking the type of whole-person care we provide can easily distinguish our locations and services across the network. Our mission is Extending the Healing Ministry of Christ, and by making the care journey easier, we can share Christ’s love, through healing and hope, with even more people in the communities we serve. You replaced Don Jernigan as CEO of (now) AdventHealth in December 2016, just over two years ago. Was the name change your idea? Our journey to transforming the organization started years ago when Don Jernigan was our CEO. We worked with a Blue Ribbon Panel, which recommended that the company position itself as a national, connected system of care. There were many meetings, stakeholder and market analysis, lots of research, case studies and white papers from Seventh-day Adventist theologians along the way. We were sure to get lots of feedback and perspectives and took a well-thought-out approach. Leading up to the brand transition, 60,000 of our team members took part in engaging training called The Whole Care Experience to prepare them to deliver consistently on the organization’s mission, vision, values and service standards. Those service standards are intended to feel personal: Keep Me Safe, Love Me, Make It Easy and Own It. All of our employees work to ensure that these four things happen whenever they are serving someone. And our goal is to provide this to every person, every time. You have worked for AdventHealth your entire career, beginning as a finance intern during a summer break from college. Now you are in the top job. You know the organization so well — has the job held any surprises for you? Is it just what you expected? I have been blessed to be part of the organization for more than 30 years, and throughout that time, I have worked with many great leaders and mentors, which helped tremendously when I became CEO. Leading a great organization with a sacred mission and so many dedicated employees is a tremendous honor and privilege. I think what is really eye-opening is how much we have grown as an organization. Today, we are one of the largest faith-based health systems in the country. We have hospitals in nine states and more than 80,000 team members nationwide. Back when I began as an intern, I don’t think I could have imagined us growing to this size and having the impact that we are having today. Can you briefly describe some of the other positions you have held in Florida Hospital and AdventHealth? Was there a job that was the hardest? One that was the most fun? Before I joined the corporate leadership team, I held roles at the hospital level such as chief financial officer, senior vice president and vice president. Each role was challenging and rewarding in its own way. For me, the thing I always enjoyed is working with teams of people to solve problems and improve things. Whether it’s planning and problem-solving at the executive level or working in scrubs on solutions that impact our day-to-day work on a more granular level, there is something special about collaborating with others behind a common goal and achieving that goal. What other changes, beyond the name, have you made in AdventHealth so far? Aside from our name, we have embarked on some pretty exciting initiatives. One is around making spiritual care a bigger part of the outpatient care experience. As a faith-based organization, we know that spiritual health plays a big part in overall wellbeing. We already have a robust spiritual care program in our hospitals, but more than 90 percent of our patient interactions happen in the outpatient setting, thus the impetus to focus on providing more spiritual support in our physician practices, urgent care facilities, rehabilitation centers and other outpatient touchpoints. To help shepherd this work, we hired and trained dozens of clinical mission integration specialists to support providers and frontline staff in the delivery of spiritual care in the outpatient setting across the system. We’ve also integrated a “spiritual wholeness” screening into visits, which asks questions specifically pertaining to love, peace and joy in a patient’s life. If a need is identified, the patient could then be referred for spiritual support. Though we are early in this work, we’ve already received thousands of patient referrals for spiritual care. This is something that we know makes a difference and fills a need. We are very excited about it. What further goals do you have for the organization? I want us to be able to fulfill our mission to the best of our ability every single day. To do that, our goal is to operate as a consumer-focused clinical company that not only provides preeminent faith-based health care, but also helps make the communities we are in better and healthier places to live. Being able to impact lives inside and outside of our hospitals is very important to us and is the key to fostering abundant life in the communities we serve. In addition, one of our imperatives is to improve our product, so we strive to continuously enhance the level of care we provide. With every consumer we come in contact with, we want to deliver exceptional experiences and outcomes. What makes Adventist healthcare different from other systems? I think the answer is found in our roots. The Adventist health care philosophy, born out of the sanitarium model, is grounded in faith and follows Christ’s healing ministry on earth as its example. Some of the tenets of the sanitarium model — good hygiene, sunlight, fresh air, nutritious food and belief in God — are still relevant and applicable today. The way we approach care is not just about treating a person’s physical ailment, we focus on the whole person: body, mind and spirit. In addition, we have the CREATION Health philosophy for delivering whole-person care and living as we were created to live. So, as you can see, a great deal of how we deliver care today is still inspired by the legacy of our Seventh-day Adventist founders. Sure, we have lots of technology and research at our disposal, but the principles that began in Battle Creek are still prevalent in our work today, which I think is amazing. Another thing is our people. We have great employees across our company, and we are fortunate to have a culture that attracts talented, mission-focused individuals who show up day-in and day-out to make a difference. These are huge differentiators for us. How would you describe the relationship between Adventist healthcare (specifically AdventHealth), and the administration of the Seventh-day Adventist Church? How closely do you work together? How do the denomination's plans for health ministries impact your plans? Our organization works closely with the church, and we appreciate and respect that relationship. Our board is made up almost entirely of church leaders. AdventHealth is an expression of the Seventh-day Adventist Church’s health ministry operating with the church’s beliefs and guidelines, so it is important for us to be actively engaged with church constituents and developments. AdventHealth has experienced significant growth in the time since you became chief financial officer in 2000. To what do you attribute that growth? Do you plan to continue to expand the network? The short answer is, yes, we do. In the last 17 or so years, we have grown in revenue from a $2 billion to a $10 billion company, and I believe we are poised to double that to $20 billion in the coming years. Now, we could grow faster than that for growth’s sake. But we strive to be good stewards, believe in smart growth and are very selective in our growth strategy. Expanding our footprint enables us to bring faith-based care to more communities. And to do that, we know that it takes great people, good plans and certainly God’s blessing. What makes you the most excited when you get into your office every morning? What do you enjoy the most? What is the hardest job you have to do? I really enjoy working with our teams. It is truly a blessing to work alongside so many people that are engaged and passionate about our mission of Extending the Healing Ministry of Christ. Whether they work in a clinical care facility or in one of our office settings, seeing our team members bring their collective talents together to contribute to our culture of service, love and compassion is great to be part of. Overall, one of the biggest challenges is knowing that each decision that I make will in some way impact our employees as well as those we are entrusted to care for. This is a tremendous responsibility, and one that I put my heart and mind into. Read Spectrum's interview with Don Jernigan. Photo courtesy of Terry Shaw.